Meet the Green Abalone:The Most Beautiful of them all? Distinguishing Characters: Shell is oval, fairly thick, reaching 10 inches in greatest diameter but most individuals between five and eight. Outer surface an olive green to reddish brown color, regular in form and sculpture, with numerous, broad, flat-topped ribs separated by narrow, straightsided grooves. The holes are small, circular, only slightly elevated (may be worn flush with shell in larger individuals) and five to seven are open. The shell may be covered by marine growths. The interior is brilliantly iridescent with predominant shades of dark green and blue. The muscle scar is vivid and striking in appearance. 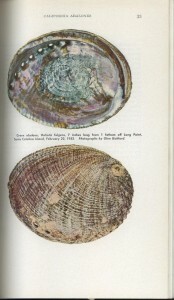 The interior is considered by many to be among the most beautiful of all abalones. The epipodium is an olive green with patches of brown. It is scalloped along the edge and small protuberances give it a rough, frilled surface. The tentacles are greyish green and somewhat short and thick and project from under the shell a short distance. This species shows considerable variation and H. splendens Reev, H. revea Bartsch, and H. turveri are synonyms. Distribution: Although reported from the Farallon Islands and from Monterey it is doubtful that the species is found so far north. Its northern range appears to be Pt. Conception and it extends south to Magdalena Bay, Baja California. This or a subspecies also is found at Guadalupe Island, Baja Califoria. Records from the Gulf of California are based upon dead shells, probably carried there by travelers. Habitat: This is a shallow water abalone inhabiting the rocky areas from about low tide out to 25 feet; occasional individuals ar taken at from 50 to 60 feet but the great majority are located in 10-to20-foot depths.